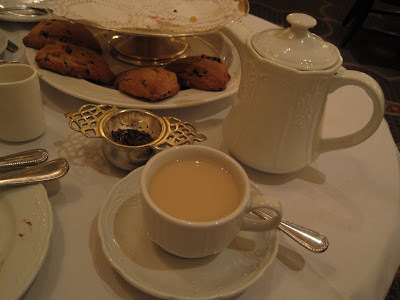 Saturday afternoon, SP & I went to afternoon tea at the Omni William Penn. This isn't especially noteworthy, except that it is holiday time and for years I've read afternoon tea reviews that say tea during the holiday season at the Omni William Penn is very nice, so I've always wanted to go at the holidays. Two weeks ago, we made a reservation. They were already booked for 3~3:30 pm tea, so we ended up with a 4 pm reservation. Tea is served in the Palm Court. When we arrived, there was no hostess to be found. An employee who had just begun his shift greeted us and asked us to wait since he had just started and was not sure which tables were open. Keep in mind we had a 4 pm reservation and it was 3:50 pm. I didn't think that was too terribly early. He went off, spoke to a few employees, and a few minutes later returned to show us to our table. It seemed a bit off and confused, but whatever. I shifted around, moving my chair around until I had a nice view of the lobby, which was decorated for the holidays. I ended up sitting a bit sideways to the table, but I wanted to see the decor. There were many other afternoon tea patrons - far more than when we were there for Valentine's Day afternoon tea last February. We waited just a wee bit too long for a menu - I started to think no one was going to serve us! 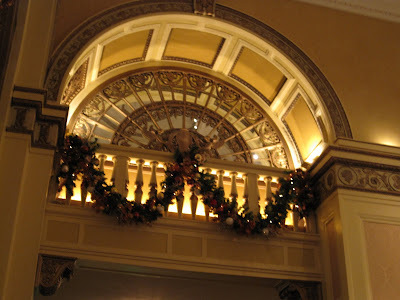 Fortunately, the holiday decor and the general decor of the Omni William Penn are quite beautiful and held our attention while we waited. 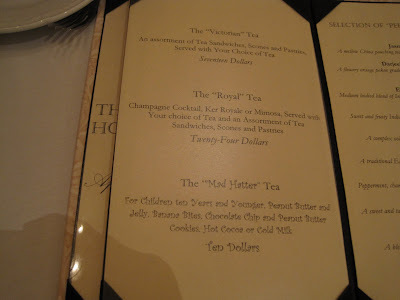 There are 2 tea options, Victorian and Royal. 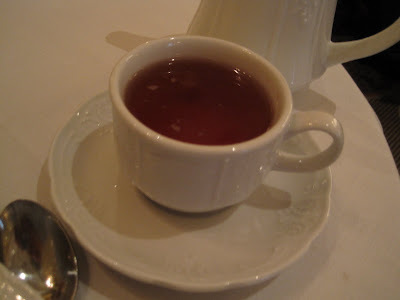 The difference is that the Royal tea includes an alcoholic beverage (champagne, mimosa, or kir royale). We weren't in the mood for alcohol, so we chose the Victorian tea. 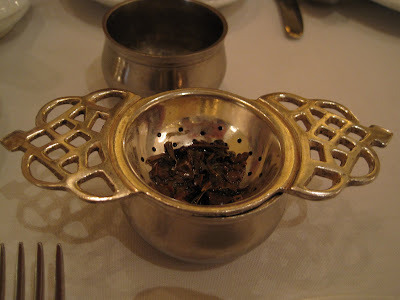 SP opted for Jasmine tea; I chose Darjeeling. I'm always a wee bit disappointed when I go out for tea and only the 'usual suspects' are available. 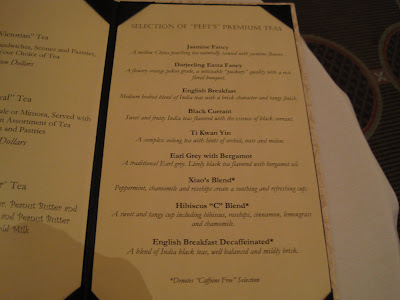 Since I don't like green teas much, dislike oolongs, and prefer black to herbal, I am invariably disappointed when the black tea selections are limited to Earl Grey, Darjeeling, Red Currant, English Breakfast. This Darjeeling turned out to be a very nice, flowery Darjeeling. SP's jasmine was flowery, too - I could smell it across the table! It wasn't long before our two-tiered try of goodies arrived. Here's a terrific, unexpected perk to the afternoon tea: our server explained that he hoped we were hungry because the kitchen had prepared a tray for four people instead of two and he just hadn't felt like making us wait any longer while they re-did a tray for two. So we got treats for four people!!! First we enjoyed our savory treats. 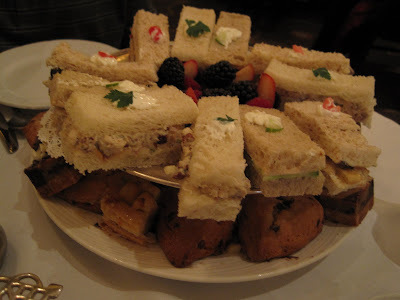 All were mini-sandwiches: chicken salad, salmon mousse with cucumber, and roasted vegetables. Both of us decided the chicken salad was our favorite. We ate the sandwiches for 4 people. Then we attacked the sweets. 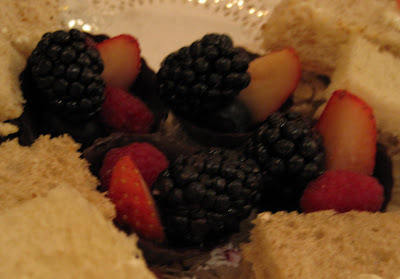 There were 4 small chocolate cups filled with berries: blueberry, raspberry, slice of strawberry, and a huge blackberry. Surprisingly, the fruit was delicious despite it being winter. 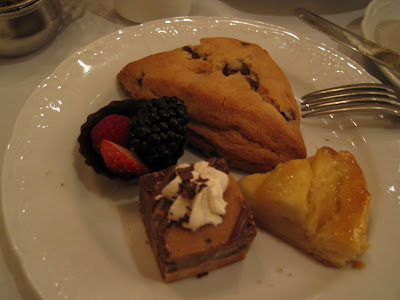 On the bottom tier were apple puff pastry treats, chocolate chip scones, and small brownie square concoctions. 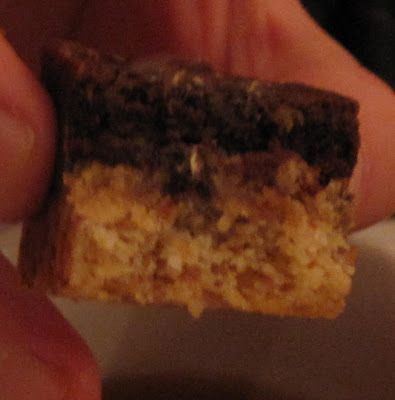 The scones had a hint of cinnamon, we thought, and the brownie squares weren't just brownies but seemed to be a mix of brownie/blondie with a bit of coconut. All were delicious. We each had a refill of hot water for our tea (my Darjeeling was a bit too strong/flowery for me when I poured the very last cup of my first pot). We nearly devoured tea for four, leaving just four scones (two persons' worth) on the tray. It was a nice, enjoyable afternoon. We both enjoy people-watching and there was a variety of people at the hotel from a person with long, gray hair clad in a sweatsuit to people decked out in party dresses and suits. 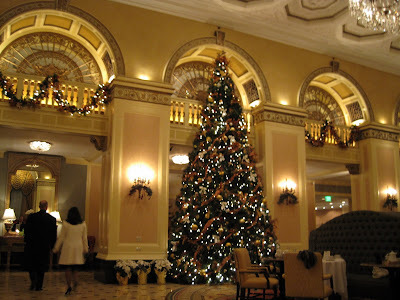 The hotel lobby is beautiful with 3 large crystal chandeliers plus an enormous holiday tree plus wreaths and garland. We would definitely go back for afternoon tea. I love the Omni at Christmas! Sooo pretty!